Quick analysis: Consumer litigation is definitely shaking things up this year. And TCPA is having a really bad year. All year the Telephone Consumer Protection Act (TCPA) has alternated between lagging behind last year’s numbers and plummeting from them. It has just not been able to catch up to the explosive growth from 2014, and now in May 2015, it is standing at a total of 1067 cases for the year to date, down nearly 10% from 1175 at the same point last year. So where did that 10% go? Let’s take a look at Fair Debt Collection Practices Act (FDCPA) litigation which – against all odds – is up nearly 12% over last year with 4683 cases over 2014’s 4192 cases at this point. Other than a slight bump in 2013 (which disappeared in subsequent months), FDCPA has been on a downward trend since 2011 (until now, that is…). To round things out, Fair Credit Reporting Act (FCRA) litigation is growing slowly but steadily over last year’s record numbers. With 1212 suits filed through the end of May, it is up nearly 15% over 2014’s 1056 at this point. Here is a chart that shows the progression of each of the three statutes over the last five years, for Jan 1 – May 31. On Consumer Financial Protection Bureau (CFPB) complaints, the number appears to be down a bit from the previous month, but up a bit from this time last year. We usually see around a 2% bump in CFPB complaints in the weeks ahead as the rest of them make their way through the system and become public. 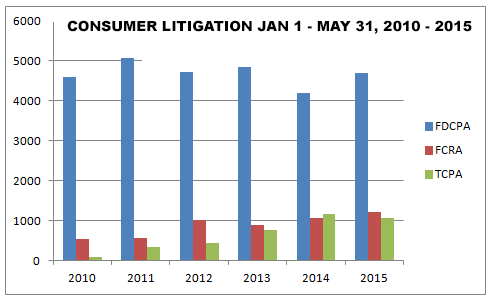 For May 2015, about 37% of all consumer litigation plaintiffs had sued at least once before under consumer litigation statutes. Class actions were relatively high, with 15.9% for FDCPA, 10% for TCPA and 16.4% for FCRA. Of those cases, there were about 1091 unique plaintiffs (including multiple plaintiffs in one suit). Of those plaintiffs, about 404, or (37%), had sued under consumer statutes before. Actions were filed in 136 different US District Court branches. About 735 different collection firms and creditors were sued. There were 3279 complaints filed against debt collectors in May 2015. This includes 3032 (92%) timely responses to complaints, and 247 (8%) untimely responses. Of the company responses, consumers accepted 0 (%) of them, disputed 327 (10%) of them, and 2952 (90%) were N\A.